For over 20 years, Buy Nothing Day has implored consumers to go cold turkey on Black Friday and not splurge until they purge…their wallets. 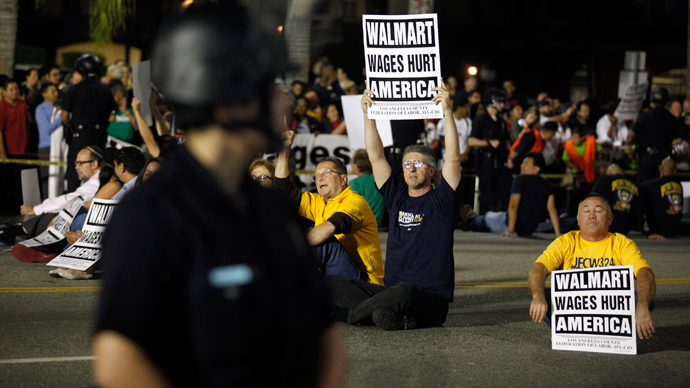 Protests this year have an especially political edge, with Walmart and other major retailers facing strikes. Somewhere along the way, the day after Thanksgiving became the first day of the Christmas shopping season. 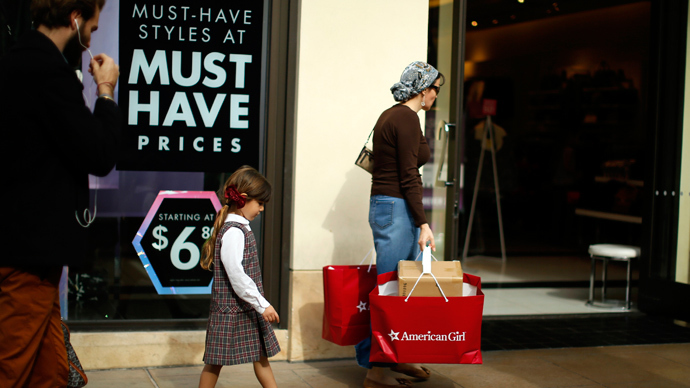 For years, retailers would open their doors at the crack of dawn on Friday, with the alarm clock steadily rolling back until midnight as the aughts [2000s] wore on. At the time employees complained, arguing that in-store salary workers were being robbed of their holiday to increase store profits. Thanksgiving is just for the elite, millions serving in the service economy commonly grumbled. The movement, which has swelled to include 60 countries and millions of people, is often defined by a lack of visible action, although zombie walks and sit-ins have been disparately organized to attract public attention. The day popularized by Ad Busters, however, has mostly been a bust. If anything, Americans are looking to buy more and more, and workers continue to pay the price. In 2012, Walmart and several other retailers continued the wayward trend, announcing their stores would open at 8:00pm on Thursday evening, prompting mostly ineffectual calls for walkouts among workers. For 2013 Walmart decided that they wouldn’t even shut up shop on Thanksgiving, opting to open up their stores at 6am. Sears Holding's Kmart, meanwhile, has been opening their stores at that time for 22 years, promising a 41 hour shopping binge for this year’s holiday season. “Traditionally, most businesses have respected their workers and closed their doors for the day, or at least allowed employees to take a few hours off to enjoy an afternoon or evening meal with family. Businesses which choose to stay open often allow workers to choose if they want to work on the holiday. But Kmart doesn't respect workers enough to even give them that choice,” a letter posted on Credo Mobilize to Eddie Lampert, CEO of Sears Holdings, reads. The accompanying petition asking that employees be allowed to stay home with their families garnered 53,310 signatures. Walmart, Best Buy, Macy’s and a slew of other retailers opted to sweeten the pot by offering workers overtime pay in the midst of the bad PR. "Virtually all our shifts and slots for that opening are being filled by volunteers," Jim Sluzewski, senior vice president of corporate communications and external affairs, told NBC news earlier this month. For those who didn’t volunteer, the corporation had its 83,000 “seasonal workers” to fall back on. But while many workers were sated with a bigger paycheck for sacrificing their holidays again at the altar of capitalism, the backlash is still brewing. 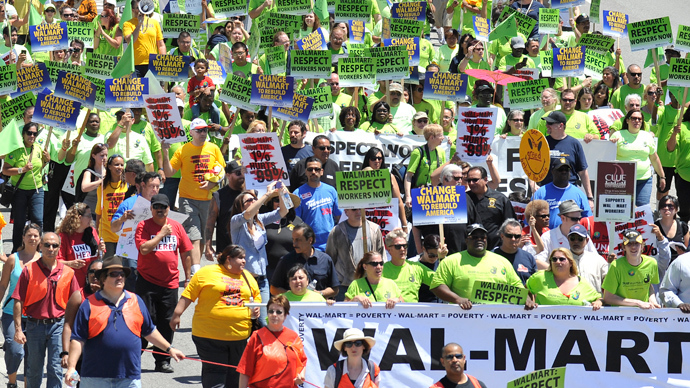 On Friday, civic disruption that doesn’t involve mobs fighting over cheap Chinese electronics is slated for 1,500 cities coast to coast, with Walmart employees and minimum wage workers-in-arms vowing to bring what they call the human cost of capitalistic excess front and center. “Workers are calling for an end to illegal retaliation, and for Walmart to publicly commit to improving labor standards, such as providing workers with more full time work and $25,000 a year. As the country’s largest retailer and employer, Walmart makes more than $17 billion in profits, with the wealth of the Walton family totaling over $144.7 billion – equal to that of 42% of Americans,” the group says in a statement on its site. One of the more bitter ironies behind this year’s Thanksgiving weekend is that many of those working through the holidays themselves don’t have enough money to put down for Thanksgiving dinner. Recently, a Walmart in Canton, Ohio held a food drive for its employees who could not afford a Thanksgiving meal, images of which immediately went viral. Last week, the General Counsel of the National Labor Relations Board confirmed that Walmart has been using unlawful intimidation and coercion to silence employees who publicly spoke out against systemic poverty and poor working conditions at the country’s largest corporation. 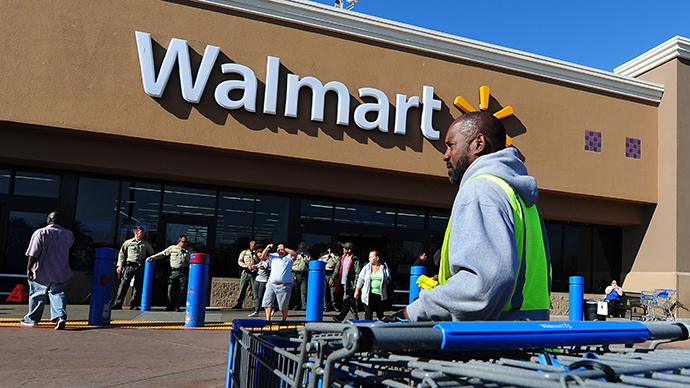 The agency charges that in 14 states Walmart store managers “threatened, surveilled, disciplined and/or terminated employees in anticipation of or in response to employees' protected concerted activities,” The Hill Reports. The unlawful behavior was documented as starting before last year’s Black Friday protests and continuing through protests around the company’s Annual General Meeting in June 2013. It wouldn’t be black Friday if aggressive crowds weren’t screaming, punching, and at times shooting their way to get the best deal on a flat screen TV before they are out of stock. In the Chicago suburb of Romeoville, a suspected shoplifter was shot after hopping behind the wheel and dragging a police officer who attempted to stop him in the parking lot of a Kohl's department store late on Thursday, the Chicago Tribune reported. In Las Vegas, a customer who had purchased a big-screen television at Target was shot in the leg while walking to a nearby apartment complex, KLAS-TV reported. The victim was taken to a local hospital with non-life threatening injuries, police said. At a Walmart in the Southern California city of Rialto, a police officer was injured after trying to break up a fight after a store manager decided to open the doors early, sparking a melee, the San Bernardino County Sun reported. In northern New Jersey, police say they pepper sprayed and arrested a man at an area Walmart following a Thanksgiving shopping dispute on Thursday night. Authorities say the suspect became “belligerent” while arguing with a Walmart shopper over a television on Thursday night, and then attacked a Garfield police officer when the manager called for assistance. And at a Walmart in Elkin, North Carolina, a screaming mob of 50 people got into an aggressive shoving match, with one man throwing another to the ground, in order to get their hands on a television. Several police officers stood by but didn’t lift a finger to stop the fight.